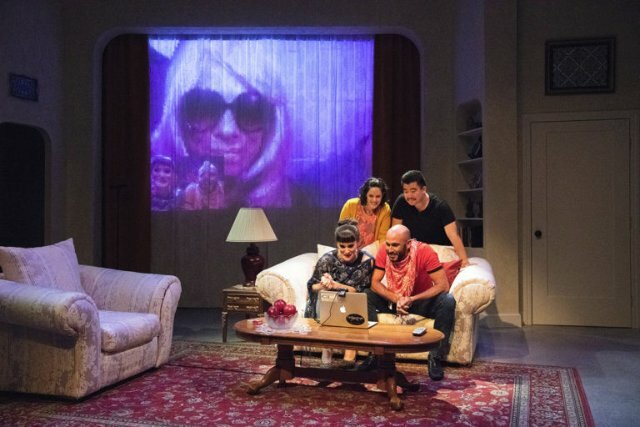 Rasha Mohamed (on screen above) as Woman; Elissa Beth Stebbins as Bana and Wiley Naman Strasser as Ahmed (seated); Roneet Aliza Rahamim as Hadeel and Phil Wong as Youssif (standing). Back in simpler times, only one kind of intelligence was recognized, as measured by an IQ test. Nowadays, there is general acceptance that there are multiple types of intelligence. The ability to communicate with a diverse group of individuals, to play middle-linebacker effectively, or to master Rachmaninoff’s Third Piano Concerto each call for a different sort of intelligence. A related cognitive theory notes that people have different styles of learning. Some learn better from visual stimuli, some from aural, others from kinesthetic. So, you’re asking, “what does this have to do with a theater review?” In part, these theories are introduced because this is a difficult play to discuss without giving too much away. And in part, it’s because these notions are relevant to Guillermo Calderón’s interesting and offbeat play, Kiss, where we find a kiss is not a kiss. For those expecting traditional narrative, this play might not satisfy. For those wanting creative structure, unusual style of message communication, and thoughtful ambiguity, this unique offering should fit the bill. And the less you read about it in advance, the better – this review excepted! It is noteworthy that Latin American telenovelas have swept the world. These mostly Mexican and Brazilian soap operas are wildly popular in areas as diverse as Eastern Europe, Western Africa, and Central Asia. Kiss leads off with the depiction of a telenovela-styled dramedy that takes place in contemporary Syria. Two twenty-something couples, bound by kinship as well as romance face revelations about hidden feelings. The episode-length skit is full of overwrought acting, relationship complications, and laughable situations that are typical of the genre. But at the end of the scene, we find that there is more than meets the eye. We have witnessed a depiction of events for which there are other explanations. Following, the structure and storyline become more complicated, and the tone becomes more introspective and serious. The show uses a play-within-a-play format in an unconventional manner, and repetition that bears an odd affinity with Groundhog Day. Along the way, we are introduced to themes of cross-cultural empathy (remember types of intelligence above? ); of intent versus outcome; and of consequences of war. And while these overarching messages become clearer, others may remain murky and subject to interpretation. Significant is how the playwright chooses to deliver his messages. Rather than conveying thoughts in a clear and linear fashion, he has chosen iterative indirection, sensing that the more provocative technique is more likely to promote the viewer’s continuing thought about the issues than a didactic approach. Remember the reference to learning theory above? In addition to the script, which is highly original, the production is excellent. The cast, led by Roneet Aliza Rahamim and Phil Wong, captures the humor and the angst of the various moments. In general, the creative side of the production is somewhat pedestrian, as is appropriate with the scenario, but with two exceptions. Kevin Landesman’s video design is striking with its jittery Skype-like close ups, and Director Evren Odcikin’s management of a powerful surprise event carries memorable impact. It’s a pity that so many clever comments could be made about this exciting play, but sharing them would spoil the fun of your seeing it unfold. Kiss by Guillermo Calderón is produced by Shotgun Players and plays at Ashby Stage, 1901 Ashby Ave., Berkeley, CA through September 23, 2018.